Refer to the Specifications tab for Required Items for installation. This Rear Grab Bar is designed to help protect your YXZ™’s rear area and fits the unit’s styling perfectly. This wiring kit is required for use with the Vantage 3000 Winch by WARN® (sold separately). Winch also requires one of two accessory Front Grab Bar options for mounting: Desert Front Grab Bar with Winch Plate or Trail Front Grab Bar with Winch Plate, both sold separately. This Trail Front Grab Bar is machined from durable, welded steel sheet and tube. 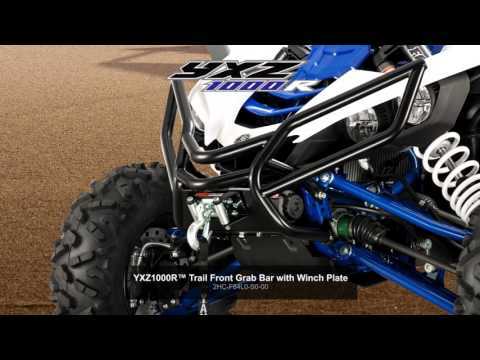 It’s designed to add protection to the front end of the YXZ from rocks, trees, branches, and other debris. Includes a winch plate that gives you the ability to mount a Vantage 3000 Winch by WARN® (sold separately).